DON’T KNOW whether or not it is a widespread problem, but the reaction to babies crying at Mass has been a frustration of mine for some time. Every now and then, a wail will erupt from somewhere the congregation, with a mother trying to calm a child. If this continues for more than a minute or so, the dirty looks follow, sometimes accompanied by audible scoffing. I have even overheard people commenting that perhaps the baby should be left at home during Mass. I understand the desire for a solemn, reverent liturgy; I wouldn’t do what I do if I didn’t believe in that. This, however, is one of my biggest pet peeves. Babies and their parents have a right to be present at Mass by virtue of their baptism every bit as much as everyone else who is present. Obviously, parents should try not to be disruptive at Mass, but remember that they are there to worship, too, and don’t want to have to skip large portions of the Mass every time their child pipes up. I have a particular sympathy with my wife here, whom I am unable to help in this struggle since I have my own business to attend to at Mass. Sometimes she simply worships through distraction, and she is a hero for it. 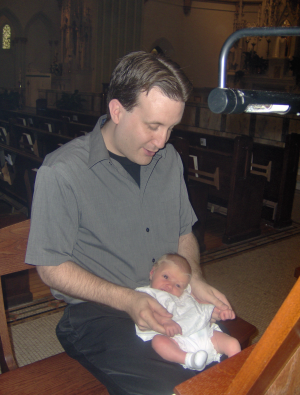 One parish at which I worked had many babies at Mass, and sometimes it was a bit noisy in there. I have also been at parishes with no children at all, and as reverent as the liturgy can be, there is also an ominous sense of a church with no future. I would sooner have to struggle to worship in a loud parish than have a quiet one that will be empty in ten years. We Catholics like to speak of the Culture of Life, and rightfully so. Part of that Culture is being willing to support and assist each other and not view anyone as a burden. Consider that the mother struggling to keep her baby quiet is mortified of the entire situation, and doesn’t need glares or judgmental comments to remind her of it. Be considerate, and if you’re brave, even offer to help. My wife, Julie, and I are expecting an addition to the Motyka clan sometime in February. If he is anything like his father, he is likely to be difficult to shut up. I am still happy, though, to hear yet another child making a noise unto the Lord, joyful or otherwise.